When it comes to skincare, I tend to stick to tried and tested brands. It is probably the cynic in me but I am ever so aware of the emergence and demand for products that are made from 100% natural ingredients. If it’s good for our diet, why wouldn’t it be good to apply on our skin…right? 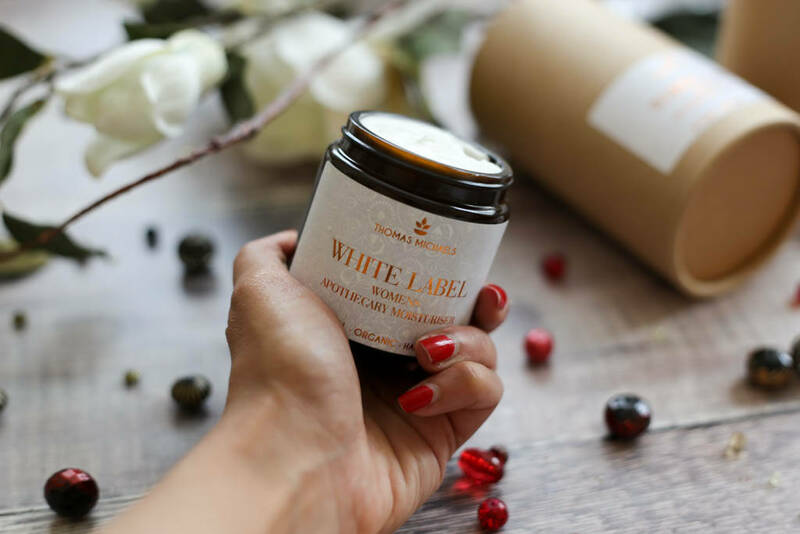 Natural and organic skincare is not something I normally gravitate towards unless it’s a brand I know, but keen to experiment I was excited when Thomas Michaels very kindly sent me their White Label Women’s Apothecary Moisturiser * to review. This is a new brand to me and their philosophy is based on creating products that are 100% safe, toxin-free and natural. 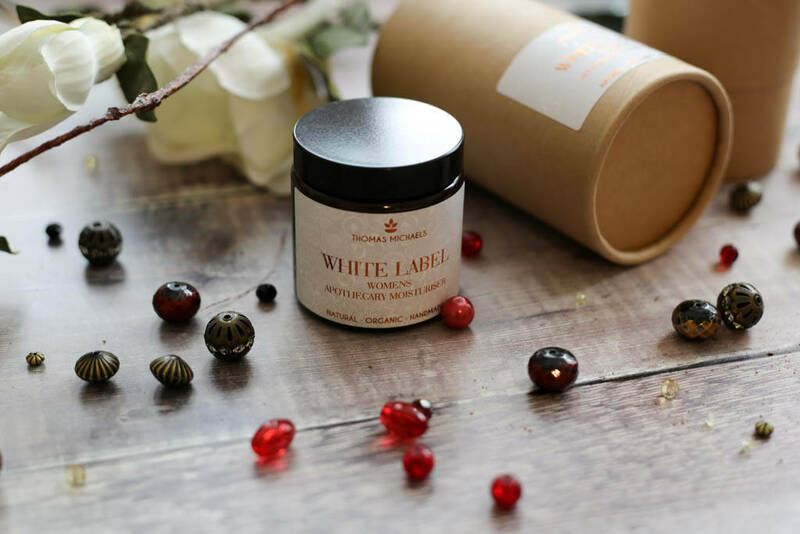 This handmade moisturiser contains a number of natural organic oils including Olive Oil, Jojoba Oil, Kukui Nut Oil and Rice Bran Oil, as well as Cinnamon Leaf Oil and Patchouli Oil – certainly an impressive mix of oils, the aim of this moisturiser being to hydrate and soothe the skin. First of all I have to say I love the packaging. It comes within a cardboard cylinder case and the jar itself has a rustic, authentic vibe to it which I think is very classy. It is designed to use both day and night but I actually prefer to use this as my night cream, partly because I don’t like to use the same moisturiser for day as I do night, but also because I find that for daytime it is just a tad bit heavy under my foundation. I think for when my skin is very dry, or perhaps in Winter, I may use this during the day too. That said, as my night cream this works wonders and has even replaced my Origins Drink up Intensive Overnight Mask. It feels very luxurious, rich and creamy yet sinks effortlessly into the skin. I definitely see a difference in that my skins feels and looks smooth, plump and hydrated and I find I have to use less moisturiser in the day too. I also use this post-gym, especially after a swim which is ideal as chlorine can make my skin feel dry and tight – luckily after using this though the moisture in my skin is instantly replaced. With a woody, citrus type scent, which took me a while to get used to, this moisturiser has a refreshing feel to it and at £25 it’s not cheap but more in the mid price range, however worth it I think given the benefits I have felt on my skin. Overall I am very happy with this product and whilst not something I probably would have known about or considered before, I am delighted I was given the chance to review this as it really has made a difference to the appearance of my skin and I love using it as my night cream. To see more products available from Thomas Michaels and if you are interested in purchasing this, you can visit their website here. *PR/Gifted. Opinions are always my own.